If you randomly ask an average person what in his or her opinion is the most important task to maximize company profits, he or she will almost always say ‘finding customers’ or ‘increasing sales’. While such an answer is correct in more ways than one, no matter how many customers a company has or how many contracts it has signed, if its products can’t get to the clients, all its transactions will fail and it will never be able to reach its revenue targets. If customers are always left empty-handed, they will not think twice about running to competitors. 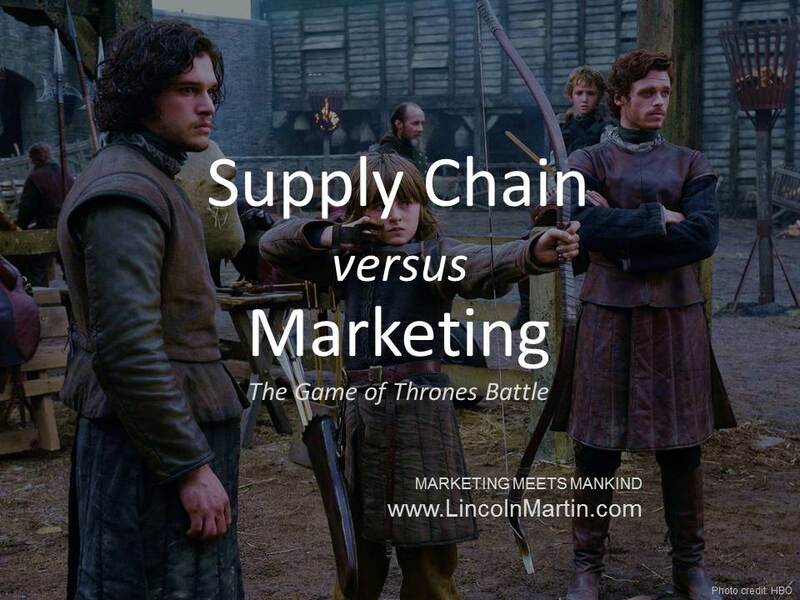 This is the scenario that frequently leads to conflicts between the Marketing and Supply Chain departments. In most cases, a company’s Supply Chain department controls the company inventory, and ensures that its cost does not negatively affect the business’ revenue. It also focuses on supplier-customer coordination, delivery performance, order fulfillment, and market responsiveness. Think of Supply Chain people as the Arryns: Their main task to ensure the viability of the company’s core products and services and to take a vigilant stance against any incoming issue that would disrupt a company’s operation. On the other hand, Marketing takes care of creating avenues for exchanges, ensuring customer satisfaction, guaranteeing product and service visibility, forecasting market demand and revenue generation. Marketers resemble the Starks: Their primary goal is to get out there and make as many connections as they can and encourage their network to continuously engage and patronize them. In the process of fulfilling their individual objectives, however, Marketing and Supply Chain will step on areas of conflicts that will create friction between the two departments. In today’s highly dynamic market, uncertainty is prevalent, and marketers may find it challenging to accurately forecast customer demands. When there is an issue on the accuracy of information, the Supply Chain department may find it hard to control the company’s inventory and may resort to being overly conservative in its estimates. This may take its toll down the line, when customer demands spike and the company does not have enough in their warehouse to satiate the requirement. Marketing and Supply Chain may find it difficult to ascertain which role should go to whom in resolving crisis situations, such as the one described above. There is a real danger that the two departments may just go on blaming each other and insisting on their perspectives. The issue may worsen in cases when the company underperforms or fails to meet its targets, owing to concerns largely involving the Marketing and Supply Chain departments. Although conflicts among a company’s departments are common and widely prevalent in any industry, if they are not controlled by senior executives at the initial stages, they can aggravate and bring in devastating effects on the company’s bottom line. In addition to managerial and executive intervention, technological innovations such as integrated systems and analytical forecasting tools may also help put interdepartmental conflicts at bay. A clear and precise definition of roles and job description, as well as collaborative strategy formation, may also ensure that office departments, Marketing and Supply Chain included, are on the same page (or same delivery truck).